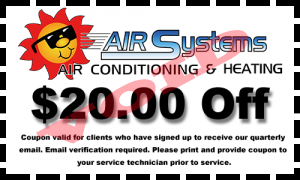 At Air Systems it is one of our owners’ voices you’ll hear when you call for service. We feel it is important that you speak with someone who is trained in air conditioning and heating service rather than someone who simply dispatches the call. Most likely we will also be one of the technicians servicing your home or business. Our experience in air conditioning and heating helps us save you money by providing accurate trouble shooting and repair solutions. When it comes to HVAC we know our business. Call on the experience of Air Systems Texas for all of your air conditioning and heating needs. We are all licenced and certified to provide the most current applications using the latest in HVAC technology. One of the benefits of hiring certified air conditioning & heating technicians is their licensure allows them to pull permits to perform the necessary work on your project. We take our work very seriously and want you to be confident when you choose Air Systems Texas that you are getting the highest level of service in our industry. This is our license number, and this number means that we have earned the privilege of plying our trade. This is our telephone number, and this number means that we have earned the privilege of working for you! Call us Today!